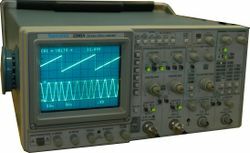 The Tektronix 2246 is a 100 MHz four channel analog oscilloscope, with limited automatic measurement capability. It is part of a nearly identical family consisting of the 2245, 2246, 2247, and 2252. Two channels are fully-functioned, and two are very limited, in both deflection factor and coupling.